Apira Science's iGrow Hair Growth system is now available over-the-counter. 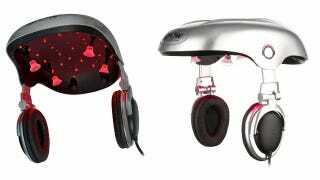 The funky looking device uses lasers and LEDs to illuminate the scalp with red light, which according to the manufacturer is supposed to work. Update: The manufacturer sent me a links to a couple of their scientific studies: "The growth of human scalp hair mediated by visible red light laser and LED sources in males" and "The growth of human scalp hair in females using visible red light laser and LED sources." Both of these appear in the journal, Lasers in Surgery and Medicine. iGrow is being touted as "a convenient, cost-effective, and clinically proven solution for androgenetic alopecia— patterned baldness — an ailment affecting more than 70% of American men." Apira received clearance from the U.S. Food and Drug Administration, so it can now be purchased without a prescription. But as this 2012 warning letter from the FDA shows, the company has a history of being a bit evasive. And the only thing that the FDA found was that it didn't really need to approve the device, adding that, "We remind you; however, that device labeling must be truthful and not misleading." According to Apira Science, the system can increase hair counts by 35% in just 16 weeks. It's a "Low-Level Laser Therapy (LLLT)" system consisting of a highly productive combination of red laser and LED diodes, which re-energizes cells at the follicle level to effectively regrow hair (it works at a wavelength of 655 nanometers). Apira claims that it's clinically proven to work. But as always, buyer beware. It's meant to be used at home three to four times a week for a period of about 25 minutes. The helmet has a pair of built-in headphones and an iPod/MP3 interface for listening to music or audio books. So even if it doesn't work you can still use it as a rather silly bike helmet equipped with headphones. The device will retail for US $696. More here and here.